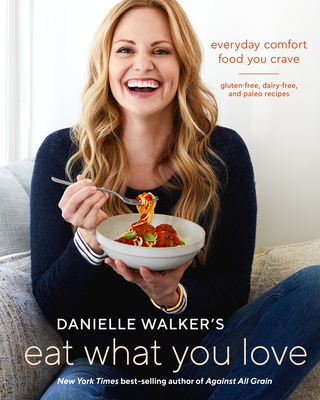 "Danielle Walker offers a new classic filled with expert tips and recipes that achieve glory while being entirely grain-free and Paleo...nothing feels like it's missing from these tried-and-true recipes." "Danielle Walker['s] new collection of special occasion recipes is a treasure trove for anyone who enjoys beautiful food." "You should never feel deprived or feel like you eat in a box, especially when you’re feeding your body. Eat What You Love is a gift to anyone with food allergies or trying to live a grain-free lifestyle. Danielle’s mouthwatering recipes show that you and your family can still enjoy all your favorite comfort foods--you don’t have to just dream about them . . .you can still make and eat them too!" "Dishes are enticing, healthy, and indulgent...but the true standout recipes of the collection are her quick and simple meals. With minimal prep and clean up, these are ideal dishes to prepare on busy weeknights. Useful chapters on make-ahead meals and desserts round out this excellent collection. For those on restrictive diets, this stellar collection will not disappoint." "Perfect as a holiday gift that will help with the ever-popular January reset." "In her new book, Eat What You Love: Everyday Comfort Food You Crave it’s all about comfort. Her recipes are loved by the gluten-free, dairy-free, and paleo crowds, and this book will surely be no exception."